The first American rockets and spacecraft to fly in the wake of the shuttle's retirement will be crewed by company test pilots -- not NASA astronauts -- in part to give space agency managers better insight into flight readiness and safety, officials said Wednesday. Assuming NASA gets the funding managers say they need -- a big if in today's political environment -- Space Technologies Corp., or SpaceX, hopes to launch a manned version of its Dragon cargo ship in the mid 2015 timeframe, followed by a crewed flight to the International Space Station later that year. A top Boeing manager told reporters the company's CST-100 capsule should be ready for an initial three-day orbital test flight, with company pilots, in 2016. A senior manager with Sierra Nevada, which has pinned its hopes on a winged orbiter similar in appearance to a mini space shuttle, said both manned and autonomous sub-orbital test flights will be used to pave the way to orbital missions. The test flights will be part of a complex certification process that will lead to NASA flights to and from the space station in the 2017 timeframe, budgets permitting. Whether those flights will use all-NASA crews or combinations of company pilots and NASA passengers is not yet clear. But until Boeing, SpaceX, Sierra Nevada or some other company fields an American-built manned spacecraft, U.S. astronauts will be forced to continue reliance on rides to and from the International Space Station aboard Russian Soyuz spacecraft at more than $60 million a seat. "For well over a year now, since Atlantis (completed the final shuttle mission), the United States of America no longer has the capability to launch people into space," said Garrett Reisman, a former shuttle astronaut who heads the SpaceX commercial crew program. "And that's something that we are not happy about. "I'd venture so far as to say nobody sitting up here on this panel is happy about that," he said, referring to representatives of Boeing, Sierra Nevada and Blue Origin, a company owned by Amazon founder Jeff Bezos. "But we're very, very proud to be part of the group, the commercial crew program, that's going to do something about that and get Americans back into space," Reisman said. "At SpaceX, we feel a sense of urgency to get Americans back into space on safe and reliable transportation, on American-made rockets." SpaceX, Boeing and Sierra Nevada won NASA contracts last August under the agency's Commercial Crew Integrated Capability Initiative, or CCiCap, program, NASA's third set of contracts aimed at spurring private-sector development of low-cost manned spacecraft to carry crews to and from the space station. SpaceX was awarded $440 million to continue development of a manned version of its Dragon cargo ship, which has now completed two flights to the International Space Station. 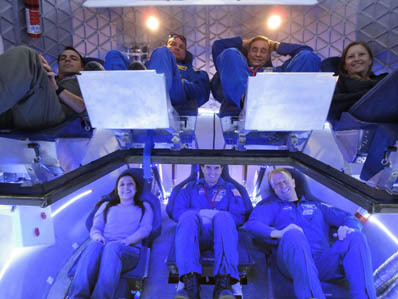 The SpaceX capsule will carry up to seven astronauts using an upgraded version of the company's Falcon 9 rocket. 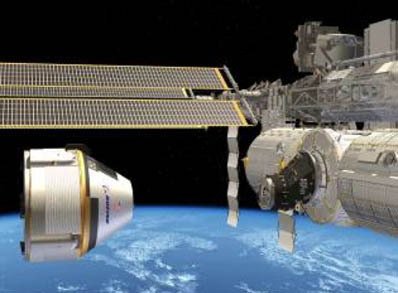 Boeing won a CCiCAP contract valued at up to $460 million for continued development of its CST-100 capsule. 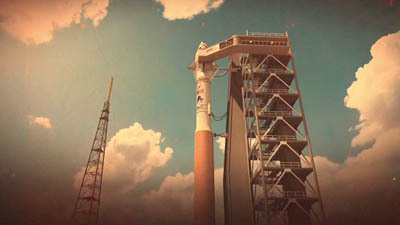 The spacecraft will seat up to seven astronauts and fly atop a United Launch Alliance Atlas 5 rocket. 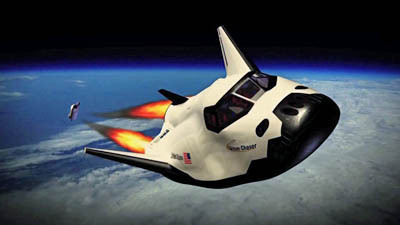 Sierra Nevada of was awarded a $212.5 million control to continue work on the Dream Chaser spaceplane, originally developed by NASA as a space station lifeboat. The Dream Chaser will seat seven and launch stop an Atlas 5. Like the now-retired space shuttle, it would land on a runway at the end of a mission. Blue Origin, which participated in earlier commercial crew contracts with NASA, plans to continue development of its own spacecraft and rocket system under unfunded Space Act Agreements with NASA. SpaceX, Boeing and Sierra Nevada laid out long-range schedules at NASA's request showing how they plan to ramp up to manned flight tests on the assumption that funding is available and no major technical problems develop. Reisman said SpaceX hopes to make its first crewed test flight "in the middle of 2015 and flying to the station at the end of 2015." "That would be done with a test pilot crew," he said. "We were told that because this would be part of the development and prior to final certification that we were not allowed, legally, to use NASA astronauts to be part of that test pilot crew. "So at SpaceX we're going to have to have company test pilots who would fly those missions. It would be a minimum crew for these test flights, we're not selling tickets. Don't call our toll-free number! Those are going to be test flights as part of the final development and test and certification process." John Mulholland, Boeing's Commercial Programs Space Exploration vice president and program manager, said his company will follow suit in 2016, following a series of major test objectives that follow a "test like you fly and fly like you test" approach. "To us, the big integrated tests, such as (on-) pad abort, we decided that we needed to incorporate those in our qualification series so it would be flight design hardware," he said. "Those would be in our next phase so you can ensure those larger tests would be done in the flight configuration." Mark Sirangelo, a Sierra Nevada vice president and chairman of the company's space systems division, said the winged Dream Chaser spaceplane has been designed from the ground up to fly in both an autonomous mode and under the direction of pilots. He did not specify when the first test flights to space might be carried out, but he said atmospheric tests will begin later this year, leading up to sub-orbital space flights and eventually, orbital missions. "Our vehicle is what we like to call 'optionally piloted,' which means it's fully autonomous and fully piloted from its design," he said. "So, too, does the flight test program alternate between autonomous flights and crewed flights. We will be going through the sub-orbital regime to get to orbital flights and we will be doing that in both autonomous and crewed versions." Ed Mango, NASA's commercial crew program manager at the Kennedy Space Center, told reporters the flight test program will resemble the model used by the military in years past when company pilots flew the initial test flights before turning a plane over to the government. "We would like them to get to a point where they're ready to put their crew on their vehicle at their risk," he said. "And so it changes the dynamic a little bit. Normally under a contract, the contractor comes forward and says he's ready to go fly but it's a NASA individual who's going to sit on the rocket, so it's a NASA risk. "What we did is we flipped it around under iCAP. It's not what we're going to do long term under phase two, but we flipped it around under iCAP and said we want to know when you're ready to fly your crew and put your people at risk. And that then becomes something that we're able to evaluate." In the end, he said, government and private-sector engineers and managers all want the same thing, "to fly safe." "They're not going to take any shortcuts," he said. "All of us have the same initiative and it doesn't matter who's sitting on top of the vehicle. It's a person, and that person needs to fly safely and get back home to their families. That's the mission of all our folks." But it will take money, and funding is far from certain. The Obama administration asked for $800 million for commercial manned spaceflight in NASA's fiscal 2012 budget request, but Congress approved just $400 million. That reduction was blamed for pushing the first NASA flight to the station back one year to 2017. The administration requested $830 million for commercial space development in its fiscal 2013 budget, but that ultimately was reduced to about $500 million. The CCiCAP contracts, valued at up to $900 million, run through end end of May 2014. Another round of "phase two" contracts is expected after that to continue development through the test flight stage. How much the administration might request in NASA's fiscal 2014 budget -- and how much the agency ultimately gets -- is not yet known. But if funding is significantly reduced or held up in a continuing resolution, at least one of the companies likely would drop out and the flight schedule would slip even more. Despite the uncertainty, Mulholland stressed that "human spaceflight is not dead in America." "There are at least four companies represented here that are working very hard to make that happen in partnership with NASA," he said. "And as we go through our budget cycles, it's important to be able to say that for not a lot of money, we've made tremendous progress and are continuing to make tremendous progress."